It’s the big thing at the moment. 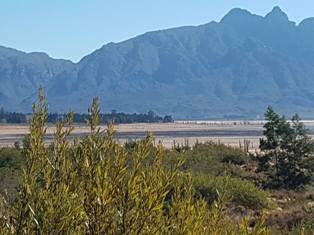 Many of us are bragging about our water saving measures, whilst some segments of the population – it seems at both extremes of the wealth spread - are blithely ignoring it. We started the last summer season after a poor winter rainfall with limited supplies of water. We haven’t had substantially good rainfall since 2013.
and in July 2016 – 43% - this is the level that has landed us where we are today. July 2017, - 26 % from a low point about the end of May of about 18%. That's 17% less than this time last year. The forecasts are, that we will receive less than average rainfall over the rest of the winter period. Best guesses are that we may end the winter with dam levels of 35 – 40 % - this is not enough to see us through a summer. So we have gone from bad to worse, if you think our current situation is inconvenient, watch out 2018! The possibility really exists, with a long hot dry season coming, and the tourist influx during December to Feb, that we will run out of water during the summer. Being referred to now as "Day 0"
Water shedding in the meantime is a possibility, but the impact on our aging infrastructure has to be taken into account. Water shedding, in the same way as we did electricity recently, and then restoring supply regularly, will probably cause more pressure bursts in the water pipes, which will cost more water than it saves. We as individuals, whether it is fair or not, need to be making a plan to store rainwater for our personal use in the event that the worst comes to the worst. Running out to pick n pay and stocking up on bottled water is not the answer. Those plastic bottles use more water in their manufacture than they contain . Also, thinking 5 L at a time is not enough, we need to be thinking in the thousands of litres. We need to be harvesting rainwater, getting an adequate filter system so that it can be rendered adequately potable, and making the most of the rainfall that we will get, to provide for lean times to come. Personally. Picture is one of my barrels, and we have a wellpoint. So far we have suffered, in our area at least, minimal drop off in pressure or supply due to a falling water table. But at some stage this will happen. Obviously we are lucky living where we do. Our home is on fairly low ground, close to the water table, and not everyone will have access to this resource. But, depressing as it is to watch our gardens wither and die, hard surfacing our plots is not the answer. The water table / aquifer relies on water falling and filtering through the ground. World wide, we create more roads, more parking, and more people are hard surfacing their spaces. This results in less water being absorbed into the water table. An even bigger problem waiting to happen. Water run off then goes into the stormwater system where it dribbles into the sea – wasted. Following is a link to a very good regular facebook post, on latest water levels as well as projected rainfall. There is some very good advice in here about what you can and should be doing. Control and click to access. We are likely to see yet more stringent measures imposed by the City of Cape Town, and an announcement about extraordinary measures is expected shortly. I am guessing we will need to be targeting, not 100 L per person per day, or the current 87L pppd, but we need to get this down to 50. It can be done with a little money, a little organisation and a lot of thought. The City is planning ways of adding useable water into the system, but in the time period, within the budget, it cannot be enough to take the pressure off. 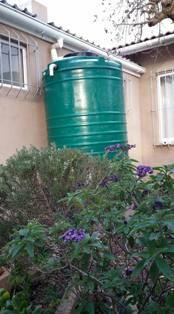 Harvest rainwater on the largest scale practical for your home and budget. Harvested rainwater can be used for all non potable use, garden, loo flushing etc, but even a simple filter can render this usable for cooking and kettle. 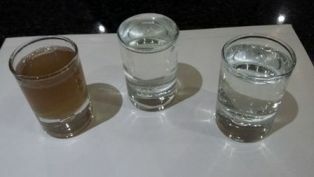 Left is water flushed from cleaning filter, centre is untreated rainwater, right has been filtered through the life straw. Recycle water wherever possible, shower water, washing machine water, cold water runoff waiting for a tap to run hot, all can easily be collected and re used. We personally haven’t got into greywater recycling yet, it strikes me as expensive for what you can gain given the fact that we never bath, limit shower use and reuse water directly wherever possible, before it goes down the drain. We will be looking at investing in a more scientific filtering system that can render my well point water and pool water potable – that strikes me as being a good thing to do and provides access to a large amount of available water come " day 0 ". With the rising cost of municipal water, investments like this will pay back in a relatively short period of time, whereafter you will be getting ahead, with an ingrained habit that will provide free water for may years to come. Water security is something I am hearing about now. 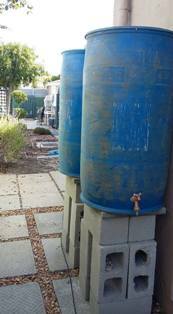 I am hearing of people stealing water from pools, wellpoints etc and actually selling it. A new criminal industry growing now. Neighbourhood watches and street committees, let's be conscious of this and look out for bakkies with barrels being filled up outside our homes. Most importantly, particularly given my field of work, if you are planning building projects, new homes or additions, think ahead about water use. Plan the position of downpipes to be in the most useful place a) to place a barrel and b) for ease of use of the water saved. Can it be next to a bathroom and plumbed in to directly supply at least a wc. 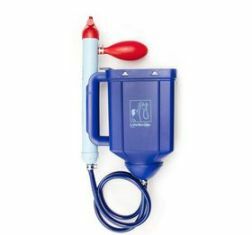 If you are fitting new plumbing, can you fit a rainwater barrel pump and filtration system that will allow you to use rainwater in the main supply to your house ?? Make sure your building contractor and every member of his team on site is aware of the issues. The amount of water that can be wasted during building operations needs to be addressed. Budgeting for an extra rainwater barrel for the contractor to use in mixing mortar etc on site will be a small extra cost compared to the total you are spending. And you will have this for ever after. Please share this widely, and let’s try and get everyone on board to save water, this current situation is one that is not going to go away any time soon.